Max warns Terry off Shane. 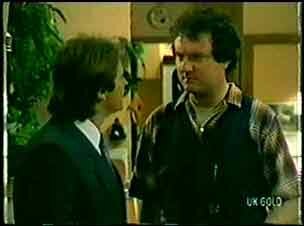 Terry tells Shane that her husband is Gordon Miller - the same one who had a part in Shane's accident. Shane has a new jobas a chauffeur - his employer, Mrs Fielding, tells him they're going to Canberra. As the car phone is broken, Mrs Fielding uses the Ramsays phone and books a hotel room in Canberra for two under the name of Shane Ramsay. Max hears this and looks shocked. Max tells Mrs Fielding to get off the phone and Shane tries to calm him down, explaining this is his new boss. Shane takes Max in the kitchen and shushes him. He explains that he's going to Canberra on a business trip. Max calms down and says he supposes that will be OK.
Max apologises to Mrs Fielding for getting angry before and starts singing Shane's praises, saying he's very honest and reliable. He also tells her about Shane's diving. Shane hustles Mrs Fielding out of the house! Shane drives off. Mrs Fielding asks if Max always jumps to outrageous conclusions. Shane says Max's bark is a lot worse than his bite. She asks Shane to explain about his diving and he tells her about his back injury. He admits that he had a car accident and Mrs Fielding suddenly clams up and tells him she doesn't want to hear any more. Maria asks Max if he's found anyone to replace Terry yet. He hasn't. MAX: I met Shane's new boss today. A woman! MARIA: How awful(!) What's she like? When Maria hears the name Fielding, she says she thinks she's read something about them. But she can't remember the details. Anyway, she is distracted by Max going on a sexist rant about women in the workforce(!) Maria says she still wants to get a job - she's got more free time, now that the boys are almost grown up. Maria says if she gets remarried she'll need to support herself. They start having words about their separation and Maria says that Max was the one who walked out - he took the easy way. Max says that any man would have done the same, given a promiscuous, lying wife. Maria looks upset and Max leaves. Julie brings Phil Martin some figures and he's pleased because she's brought them early. Julie says he's doing a really good job so far. They chat about their personal lives and he asks Julie if she has a boyfriend. Phil is still staying in a hotel. 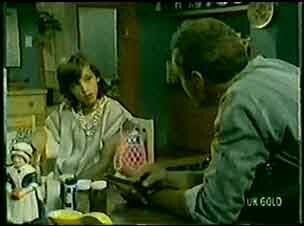 He starts reading the figures and is distracted when Julie asks him about his own family. JULIE: Well, I'd better head back before I get into trouble with the new bank manager! PHIL: Yeah I know, I've heard he's a bit of a monster! Phil asks after Julie's car and she says it's still being serviced. He offers her a lift home tonight and Julie gratefully accepts. JULIE: Well, if you insist. Jim comes in and finds Paul there. He asks Paul if he's still going out with Gloria. He hasn't - she and her mum have moved to Adelaide to get away from Charlie. Paul misses her, but there's nothing to be done. Gloria has got a good job and she's trying to get her mum working too, so she won't have anything to be dependent on Charlie for. Jim says he's proud of Paul for how he handled the situation. Terry knocks on the door and Maria answers it. Maria apologises for Max's behaviour. Terry has come round to see Shane, but he's gone away to Canberra with his new boss, Mrs Fielding. Terry is a bit surprised that Shane is with a woman, but Maria says it's a business relationship only. Maria tells her not to give up on Shane. Lucy explains that she needs a long dress for dress up day at school tomorrow. She doesn't like this dress though - she thinks it's very old-fashioned. Jim suggests borrowing one of Julie's dresses, but she says she doubts Julie will let her. Lucy goes into the living room. Lucy asks Scott to asks Julie if she'll lend her one of her dresses. Scott says there's no point him asking - she'll still say no. Phil is dropping Julie off and she thanks him for the lift. She looks a bit nervous and then invites Phil to come in for a drink. But he says he's got a lot of work to do. He drives off. Julie looks rather disappointed. Lucy is at the window saying to Scott that she can see people kissing. But she's just making it up - although she says Julie was in the car with a man! Julie comes in and Lucy and Scott grill her. But she says she just got a lift home with the bank manager. Julie tells her to mind her own business and goes into the kitchen. JULIE: Lucy's being very childish. Since Helen is out, Julie offers to take over making the dinner. She tells Jim about the new bank manager and says she hasn't had a lot to do with him on a personal level. Jim is confused and says that he thought Julie went out for a drink with him the other night! Julie says that was just a friendly gesture. Shane comes back from Canberra and says Mrs Fielding is a real slave-driver. She's apparently a complete workaholic. She never talks about her husband though. Maria says that Terry has been around. Shane says he was rude to her the other night, but Maria says that Terry isn't holding a grudge - she came round to see him yesterday. She gives him Terry's note. Julie is making breakfast for everyone. She is humming and appears in an excellent mood. PAUL:(to Jim) What's brought all this on? JIM: I dunno mate. But whatever you do, try not to spoil it! Paul asks Julie to sew a button on his shirt and she readily agrees. Paul looks stunned. SCOTT: You don't think Julie's caught some terrible disease, do you, Dad? JIM: I wouldn't be too sure mate...but if she has I hope there's no cure for it! Jim advises Lucy to strike while the iron's hot and ask Julie if she can borrow a dress. SCOTT: I bet you two dollars she won't. In the living room, Lucy sidles up to Julie and explains about the dress up day at school. She asks nicely if she could borrow one of Julie's dresses. Julie tells her that as long as she looks after it, Lucy can chose any one she wants from her wardrobe. Lucy is very pleased and goes off to look. JIM:(to Scott) I'll deduct it from your pocket money! Terry and Shane have had lunch. Shane says he thought about her all the time in Canberra. Terry says she has to tell Shane everything about her husband. She isn't still involved with him, but when she left he went crazy and threatened to kill her. She ran away and thought it'd be safe to come back to the city now. But she's been getting some threatening phone calls. She wants Shane to know what he's getting into. Shane suggests that Terry leaves her flat and moves into Des's spare room. He'll ask Des about it. Besides, he likes the idea of Terry living almost next door. "Convicted bank robber, Gordon Miller, has just escaped from a police van..."
He had been due to do ten years for armed robbery.